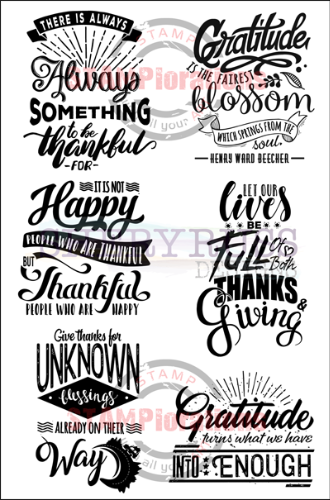 ONE (1) package of WORDS OF GRATITUDE clear stamp set in the Shery Russ Designs line. There are 6 pieces of clear stamps in the package. This stamp set is in a backing sheet packaged in a 4" by 6" resealable hang hole cello bag. For your reference, the sentiment on the uppermost left (There is always always something to be thankful for) is approx. 1.55" wide and 1.90" tall.